If my kitchen was a classroom, pie would be the final exam. The crust requires a level of dexterity and attention to detail far beyond what’s needed for most baking recipes, and even the most minor of errors can affect the final result. The pie filling itself is a test of knife skills and ingenuity, and the technique used for slicing the fruit can make a huge difference in the pie’s overall flavor. Even the construction of the pie requires a certain amount of self confidence, asking the baker to take a leap of faith when draping the top crust over the filling. Naturally, some doubts arise. Will the crust be crispy? Will the top cave in on itself, creating an flood of syrupy fruit? With that in mind, I’ll admit that this is only the second pie of my baking career. Pie recipes intimidate me with their long list of ingredients and string of “do’s” and don’ts,” and I avoid them as much as possible (see this apple galette as a wonderful pie alternative). To make a worthy pie, I knew I needed to do some research. What did I find, you may ask? 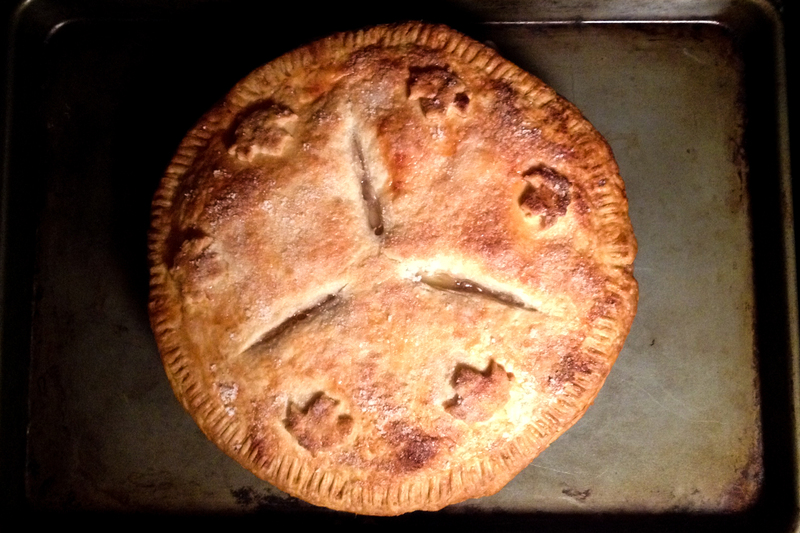 From The Kitchn, I learned the importance of pre-baking the applies before assembling the pie. Since the apples lose water and shrink in size during baking, this step eliminates the potential gap between the top pie crust and the filling. This isn’t too surprising, since lauded bakeries like Baked in Red Hook and Three Babes Bakeshop in San Francisco both bake their apples before using them for pies. My research also taught me that apple varieties are distinct and should not be used interchangeably. While my original plan was to go with Golden Delicious apples, mixed reviews of the apple’s texture after baking caused me to pick Cortland instead. For a comprehensive list of good baking apples, read this article on Epicurious. Through trial and error, I discovered a few tips for making a good crust. First, keep the butter as cold as possible, chopping it up and placing it in the freezer if necessary. These small pieces of butter will melt during baking, creating a wonderful, flaky texture. Make sure to use ice water (or tap water filled cooled with ice cubes) since this will help keep the mixture chilled during the mixing process. When it comes to adding the water, be careful to add just the right amount. Too much water will reduce the flakiness of the dough, while not enough water will lead to a dough that is crumbly and and ultimately impossible to roll out. I learned this the hard way, dumping my first version of the crust in the trash after a frustrating round with the rolling pin. When you have just the right amount of water, the dough should come together easily and feel slightly sticky. Before assembling the pie, stick the prepared pie pan (with crust) in the freezer for 30 minutes or more. You want the crust to absorb as little liquid from the apples as possible, and this method is pretty reliable when it comes to preventing a soggy crust. Lastly, take the bonding process seriously! The fork marks above aren’t just for looks – they actually hold the filling inside the pie as the entire pastry warms and begins to bubble during baking. If the bond between the top and bottom crusts isn’t strong enough, you’ll notice that some filling will ooze between the layers. As you can probably tell, this recipe takes time. But for those that are patient and ready to invest some effort, I promise that this recipe will impress a crowd! Combine flour, sugar, salt, and cold butter in a large bowl. Make sure that the butter is very cold (if you like, you can even stick it in the freezer for a few minutes before beginning this step). Using a pastry blender, begin to slowly cut the butter into the dry ingredients. This process is complete once the mixture attains a crumbly texture – each crumb should be the size of a small pea. Be careful not to over mix the dough, as this will interfere with the flakiness of the crust. Prepare the ice water. I always fill a cup with around 2 cups of water and add 3-4 ice cubes, and then remove the amount of water requested in the recipe. Slowly drizzle 1/3 cup ice water into the dough. Begin by using your pastry blender to integrate the water into the mixture, but switch over to using your hands once the dough become too sticky. Add the remainder of the water until the dough comes together easily into a ball – it’s still too dry if the dough cracks easy and falls apart into the bowl. Using a knife, cut the dough into two halves. Form each half into a round ball, flatten it, and cover with plastic wrap. Store overnight in the fridge before using. Peel and core apples. Cut each apple into 1/4 – 1/2 slices, depending on how chunky you would like your pie filling to be. Melt the butter over medium heat in a large saucepan. Once hot, add the apples and stir to coat with the butter mixture. Quickly add the sugar and spices, stir well, and reduce the heat to medium – low. Allow the mixture to simmer for 5 minutes more. Add flour and cornstarch to the saucepan and stir to combine. Cook for 3-5 minutes more, until the apples are tender but do not lose their structure. Add the cider vinegar or lemon juice and allow to cool completely before adding to the pie. Remove the dough from the fridge and let rest at room temperature for 5 minutes. Lightly flour your work surface. 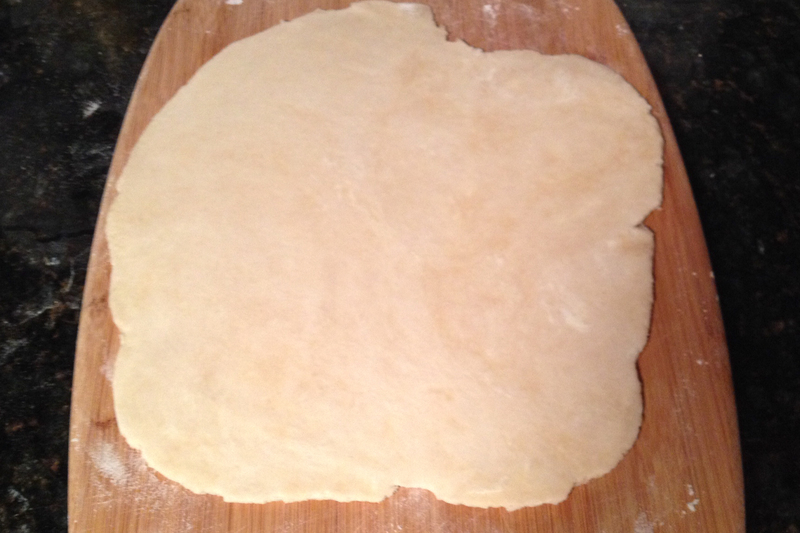 Using a rolling pin, begin to gently roll out your dough into a 12 inch circle. Remember, technique is key here – if you go too quickly or use too much pressure to roll out your dough, it will begin to crack. (Tip: Every 3-4 strokes, pick up your dough and rotate it 90 degrees. This will ensure that the dough does not stick to the surface). Gently pick up your dough and place it in a 9 inch pie plate. The dough should hang about 1/2 inch over the edges of the pie plate (this will help you later to bind the top and bottom pie crusts). Cut off the excess dough with scissors or a sharp knife and place the prepared pie shell in the freezer. Preheat the oven to 425 degrees and place a large baking sheet inside the oven. 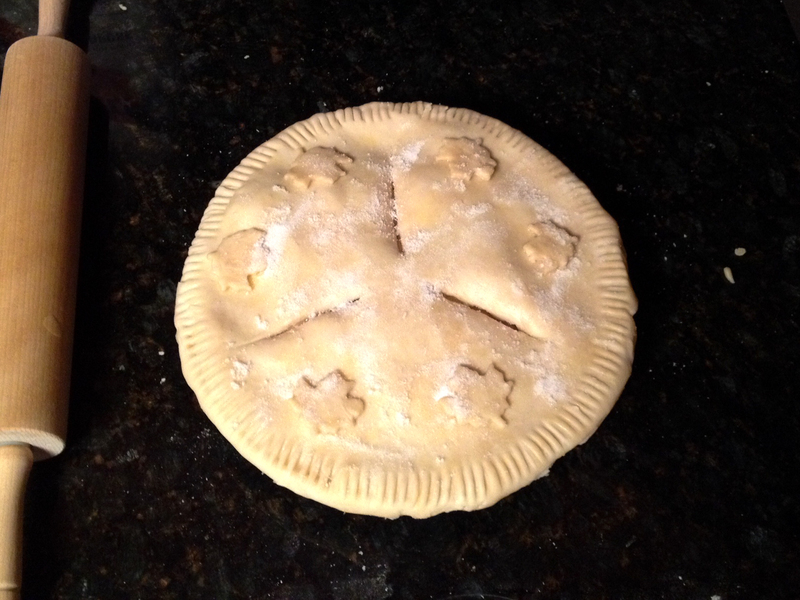 Once the filling is completely cool, roll out the top pie crust following the same directions as above. It can be a little smaller, around 10 inches in diameter. Remove the pie shell from the freezer and pour the filling into the pie. 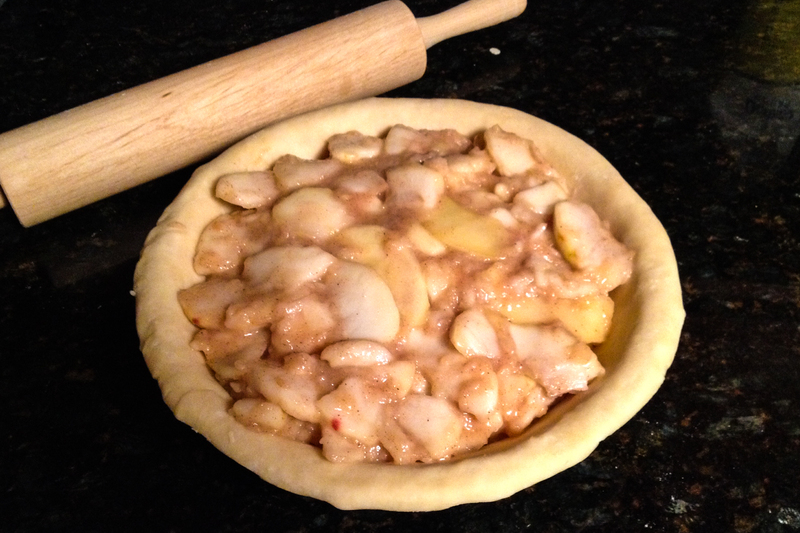 Gently place the top pie crust over the filling, making sure that the dough hangs over a bit on all sides. Using a fork, lightly press into the edges of the pie to bind the top and bottom crusts. This part is important, since the filling will seep out during cooking if the edges are not bound correctly. Cut three slits all the way through the top pie crust using a very sharp knife. If the dough is soft and too hard to cut, place the pie in the fridge for a few minutes before completing this step. Brush the pie crust with the egg wash and sprinkle withe the remaining sugar. 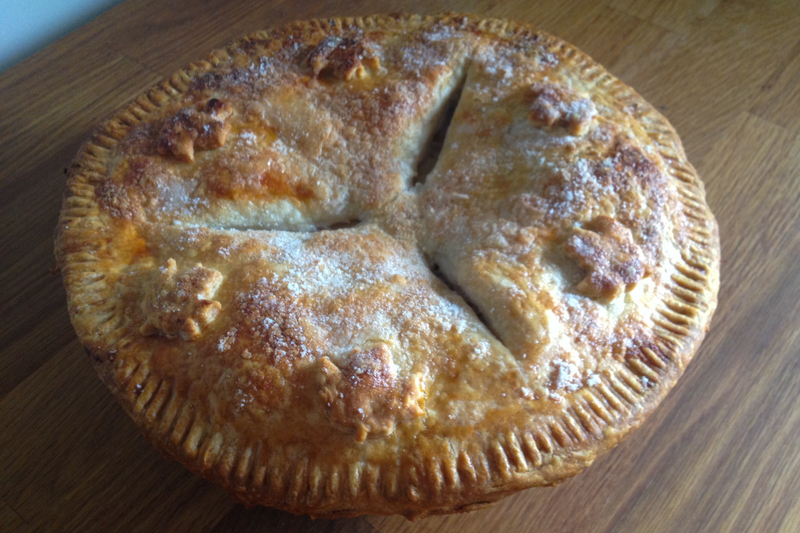 If you would like to make the tiny leaves on this pie, roll out the excess dough from the pie crust. Using a cookie cutter, cut out 5-6 little leaves. Use the egg wash as a binding agent, lightly coating one side of the leaf with egg wash and placing it on the top pie crust in the desired location. Place the pie on the hot baking sheet and let it bake at 425 degrees for 20 minutes. Reduce oven temperature to 375 degrees. Allow pie to bake for 35-40 more minutes, or until the crust is flaky and assumes a deep, caramel color. Let pie cool completely at room temperature.